February 6, 2014, 12:13 PM · The "Lipinski" Stradivarius violin was recovered from an attic in a Milwaukee residence overnight, and the violin was apparently treated with care during its adventure with art thieves, police said at a press conference Thursday at Milwaukee Police Department headquarters. The violin, valued at $5 million, was recovered in an attic at the residence of a friend of one of the three suspects police had arrested yesterday. Police said that the owner of the residence was unaware of the contents of the suitcase that the suspect asked to leave there. 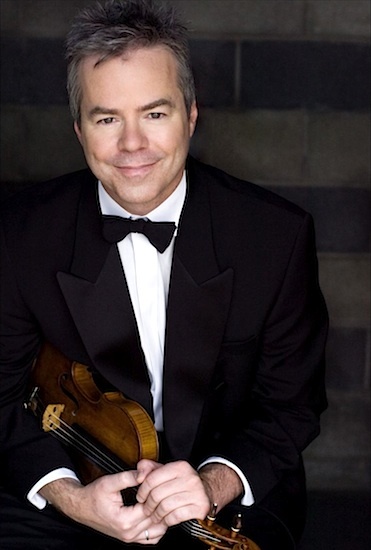 The violin was stolen on January 27 from Milwaukee Symphony Concertmaster Frank Almond, who was walking to his car after a concert when he was shot with a taser, then robbed of the violin. The violin, made in 1715, was the subject of a 2013 project called A Violin's Life. Police said that the violin had been treated well. "In the realm of things stolen, it was treated carefully by the people who stole it," said Milwaukee Police Chief Edward. "They didn't have a violin case, but they had a suitcase, and they treated it gingerly." Police had recovered the violin's case when it had been discarded near the crime scene during the getaway, so when they recovered the violin, they returned it to its case. It remains at Milwaukee Police headquarters. "The FBI literally handled it with kid gloves. We took great pains to put it in a very safe place, we handled it like a baby, but we didn't powder it," said Flynn. He said the fiddle looked good, joking, "I think it looks pretty damned good for a 300-year-old, not a day over 250…"
Frank Almond, who is currently in Florida, has not seen the recovered violin in person, though he has viewed photos of it, said Milwaukee Symphony Orchestra President Mark Niehaus. "He's thrilled the violin is back," Niehaus said, adding that the bridge appears to be intact, the sound post is up, and the strings are in place. He did not know if Almond would continue playing the violin, but said that "these instruments must be played to live on -- if you just put them in a case, they tend to deteriorate." Two male suspects were identified as Universal Knowledge Allah and Salah Jones. With the help of Taser International, the FBI tracked the purchase of the taser to Texas, where it reportedly was purchased by Allah. Police did not uncover a third party, or a deeper conspiracy in the theft. "It appears we had a local criminal who was interested in art theft," said Milwaukee Police Chief Edward Flynn. "He has a previous history as an art thief." The suspect was tied to the theft in 1995 of a statue called "Woman with Fruit" by Nicolas Africano, from the Michael Lord Gallery in the Pfister Hotel, according to the Milwaukee Journal-Sentinel. Though police said they did not know the suspect's ultimate plans for the violin, Flynn pointed out that in the 1995 theft, the suspect kept the $25,000 sculpture for four years, then tried to sell it back to the gallery's owners. He did appear to understand the value of the violin. "He had done his homework," Flynn said. District Attorney John Chisholm said that charges will likely be filed tomorrow. Police did not say whether a female suspect who had been arrested yesterday would be charged. Police are still looking for a getaway van. February 6, 2014 at 07:48 PM · There is a good ending sometimes. February 6, 2014 at 11:35 PM · Bravo PD!!!!!! February 9, 2014 at 03:27 AM · I hope that Frank keeps playing this violin. I am so happy it was found in good condition, what a treasure to share with audiences for years to come. February 9, 2014 at 05:00 AM · I was worried it would disappear forever. Nice work FBI and Police. February 9, 2014 at 09:48 AM · Even in Germany we followed the event of the stolen Stradivari of Mr. Almond. Good luck, it has been found so fast. I myself play a Viola from year 1620, which sounds lovely, but is of no commercial value. That is, because it has not been built by o n e luthier. The huge instrument with a lions head had been rebuilt out of two damaged big violas da bracchio in the 17th or 18th century. In my viola case I built in a GPS-Tracker. February 9, 2014 at 01:46 PM · Is Mr. Almond alright? I had read how he had been tased but had not heard how he was. I have thoroughly enjoyed his album A Violin's Life, which thank you, Laurie, I had won on violinist.com. I sincerely hope that Mr. Almond will continue to play this treasure. He truly made the instrument sing. My thoughts and prayers are with him. February 9, 2014 at 08:53 PM · There's no mention of Almond's bow(s). Were they recovered along with the case?